Yesterday the Washington Post published a wonderful profile of me titled, “It’s no longer okay to be sexist or racist. She asks why it’s still okay to be ageist.” I’m getting a lot of mileage out of it, and learning a lot in the process. One lesson is that the title of the piece led some readers to assume that I think we’ve put racism and sexism behind us. Far from it; we have a very long way to go on both those fronts. But because of the civil rights and women’s movements, those forms of discrimination are no longer socially sanctioned—which is why we need to mobilize against discrimination on the basis of age. I need to be clearer when I make these comparisons. I also learned a lot from a fascinating thread on Metafilter, an online community where someone posted this excerpt from the Washington Post article: “’Our society is so ageist that younger people don’t want to sit next to older people because they think they’re boring, and older people might think they have nothing to say to younger people.’ So says Ashton Applewhite, a blogger that has just published a book about ageism.” What follows is an absorbing, troll-free, multi-generational exchange. There are tons more interesting comments, especially about ageism in the workplace (tech in particular) and its disproportionate effect on women’s lives, and I strongly recommend checking them out. I can’t resist closing with this one: “I bought the book and have been reading it this afternoon. Your comments about the Meetup are just what the author is talking about. Her thinking is that allowing jerks who dismiss you, or ambient noise levels that keep you from hearing easily, dissuade you from going out is allowing ageism to win.” Push back! 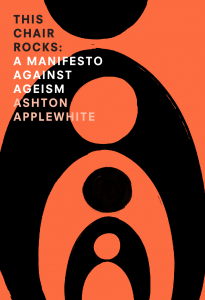 Huge thanks to to everyone who ordered, shared, and recommended This Chair Rocks: A Manifesto Against Ageism. 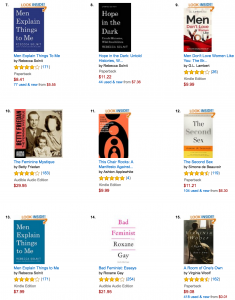 Each copy, and each of you, is playing a part in getting an anti-ageism movement underway. There will be more asks, because it’s going to be a long haul and it’s going to take all of us, so it’s great to see the book off to such a great start. If you haven’t ordered your copy yet, please do. Check out the company I’m keeping (below). Thank you, everyone—let’s keep it going. I’m lucky that the first person to review my book is Matt Perry, Aging Reporter for the California Health Report. 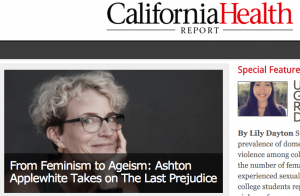 He was one of the first journalists to interview me, very early on in this project, and his review, titled From Feminism to Ageism: Ashton Applewhite Takes on The Last Prejudice is quite the gift on the eve of publication day. That’s advance praise for my anti-ageism manifesto—sneak peek here—from eminent Cornell gerontologist Karl Pillemer, author of 30 Lessons for Living. The full blurb reads, “The problem of ageism has long been in the shadows, overwhelmed by the cultural barrage of ageist “humor,” media stereotypes, and age segregation. Not any more – now that we have This Chair Rocks: A Manifesto Against Ageism. A magnificent mix of personal reflection, cultural criticism, and cold hard facts, this remarkable book should spearhead an “anti-ageist” revolution – which can’t come a moment too soon.” If you agree, please order a copy now. The pub date is March 15. This guest post is by Ron Pevny, Director of the Center for Conscious Eldering, author of Conscious Living, Conscious Aging (Beyond Words/Atria Books), host of the Shift Network’s “Transforming Aging Tele-Summits,” and a kindred spirit. In recent years, a host of psychological and biological research has been adding its voice to the age-old wisdom of the world’s spiritual traditions in emphasizing the importance of belief and attitude in determining how our lives unfold. Let’s look at two very different beliefs about aging. Since the “modern” era began, aging has largely been seen as a time of decline, loss, and withdrawal from active contribution. Look up the word “retire” in the dictionary; most of the definitions include the word “withdraw.” Accompanying this view is the belief, held in both overt and subtle ways, that once we retire, “it’s all downhill from here.” Our best years are over, with us by and large having made our significant contribution to society. Loss of a sense of purpose and meaning, and a flagging of our passions for life, is to be expected. The best we can do is hold on to who we have been for as long as possible, doing our best to stay healthy, enjoying life to the extent our health and finances will allow, perhaps finding some volunteer activities to keep us occupied, and hoping things turn out okay. Contrast this with another set of beliefs that sees aging as a process of development of character analogous to the development of fine wine over time. Aging is understood as a necessary prerequisite for developing the wisdom that comes only from experience and reflection. This stage of our life provides time and opportunity for focusing on our deepest values, our personal development, our spiritual life, and our relationships with our loved ones and communities. These decades are not just the final chapter after we have passed our prime, but rather a time full of possibility for fulfillment, meaning, passion and active community engagement—if we consciously work to make them so. If we resonate in some way with this second perspective, a critical first step for us is exploring, with as much honesty as we can muster, the beliefs and attitudes we hold about aging. Living in a society where the first set of beliefs are strongly dominant, for most of us these are strongly engrained and hold great power. One way to know how much they influence us is to honestly look at the fears, hopes and beliefs we carry about our aging process. Only by becoming conscious of those inner dynamics that shape our lives can we do the necessary work of transforming disempowering inner images with images that can support our growth and fulfillment in our later chapters. Do I do everything possible to convince myself and others that I am not getting older? If so, why? Do I believe that once I reach retirement age, it’s basically all downhill from here? If so, why? Do I believe my worth is primarily tied to what I can do, or is it a reflection of the kind of person I can be? Which of these beliefs will best serve me as I age? Have I developed a vision of my ideal elderhood? If so, what will such an elderhood encompass? If not, why not? What can I learn from those people I know or know of who seem to be models for aging well? What can I learn from those who seem to age without joy and purpose? Do I see my life as an unfolding process of growth, or is growth not something important to me? Am I willing to stretch beyond my comfort zone in order to find fulfillment? Have I developed the resilience to move forward gracefully in the face of loss? If not, how might I work on this? Do I believe that my beliefs make a difference in how my life turns out? We have choice in how we age. The more we engage in denial, the more we surrender to disempowering beliefs and attitudes, the greater our risk of being painfully unprepared for the inevitable losses as well as the unique opportunities that accompany us on our journey through life’s later chapters. We have the power to choose the beliefs that shape our lives. We have the power to become the kind of people others look to as models for aging well. Whatever circumstances life presents, we can treasure each day of our one precious life. Noa Zilberman “celebrates ageing with an expression of delicate gold,” says the label at the Cooper Hewitt Design Museum. Her pieces settle lightly on the lines around eyes, mouth, brow and cleavage that the Israeli artist noticed after the birth of her son. How artfully they disrupt the ageist and beauty-industry-driven notion that wrinkles are ugly. What doesn’t kill you makes you stronger. This less awkward iteration of Nietzsche’s aphorism ran through my mind as I was thinking about your extraordinary book, Ashton. As a woman crippled by polio at the age of 3, it was remarkable how much of what you described in the book applied to my own adaptations to disability and, at the same time, how complex and confused those adaptations were. Fight, adapt, accept, resist, get on with it, relax, find a partner(s), learn to live happily alone, … The options are endless but what is clear is that whatever options we choose–and being able and permitted to is all important–we all need help at some point. That American society often conspires against us in getting the help we need is something you also make abundantly clear. As a child, I was more afraid of old people than vampires. Only my immediate family had survived the Holocaust and my exposure to the truly old was very limited. I managed to get through my teens and early twenties without really knowing any olders. It was only on the wards during medical school and internship that I encountered olders and became fascinated by them. When they weren’t thinking I was their nurse (sexism, partly, but mostly the belief that a disabled person couldn’t possibly be a doctor. In reality, it would have been much more difficult for me to be a nurse) or complaining that I was too young to be their doctor (a different form of ageism), I was treated to wonderful stories of joys, hardships and often remarkable resilience. It might seem paradoxical to have developed an appreciation for olders from people who were ill or injured. And, of course, I had to deal with some who were depressed, disgruntled, and not compos mentis or even sentient. But, over and over, what I came to realise is that what most of them wanted from me was to get them back to their lives in as good a condition as possible and that those lives were considered worth living. Geriatrics was not a specialty I was aware of in medical school nor was there much attention paid to disability or rehabilitation. I do remember one lecture from an orthopaedic surgeon where he stated that the reason most people with lower limb problems did not walk on crutches even when they could was the energy expenditure involved. He said that the only sport with exertion greater than that of walking on crutches was cross country skiing. I figured that didn’t bode very well for my future and that I was still right to be fearful of age. But at 69 I’m still walking, albeit more slowly and with more difficulty. One of the things I truly love about the book, Ashton, is how much of you comes through in it–your questions about your own fallibility, your doubts, your humour, your kindness, your boldness, your empathy, and your search for answers. I admire your ability to synthesise a large body of research so that it is easily understood. I could go on forever about what I learned and what more I wanted to understand, personally and globally. Thanks. That’s the title of a galvanizing post on Midcentury Modern, a site where “The formerly young get their say in this this smart conversation about age, identity and generational politics in America.” I’m delighted to be part of it, and even more so to see comrades growing in number all the time. The phrase spraypainted on that wall is attributed to Maggie Kuhn, founder of the Gray Panthers. Needless to say, it made my day and then some. The audiobook recording starts tomorrow, eight hours straight. I’m gargling. And I’m excited.